My nephew Steven, who lectures in sports psychology, has written this very interesting article about finding the right mental approach for a successful and enjoyable day's fishing. It's quite an original piece of work, I think, touching upon certain aspects of angling which, perhaps, are not often considered in any depth. I present the article here, with his permission, for the benefit of the readers. The mild westerly breeze and clouds with an alluring shade of grey indicate that today will be a good day. A shared car journey with your companion evokes accounts of past red letter days and predicts a net full of intended quarry in the hours to come. Preparation was (in your experienced opinion) perfect, and with most external variables seemingly favourable, the only component left to perform are the scaled leviathans whom you wish to tempt from their snaggy lair with either bread or worm. As you arrive at your swim you are reminded of Crabtree - if he could design such a spot he would, perhaps he did – and you rejoice in this thought. A sunken tree to your left, the surface of the lake flat like a glass coffee table is disturbed only occasionally by the swirl of a tail pattern or eruption of bubbles and this does little to diffuse any eagerness to cast a line. We, as anglers, have all sat by this pool and placed our float to within a millimetre of perfection, just off that sunken tree with a first cast…and so we wait for the inevitable slide and disappearance of the quill. But, the pursuit of fish, as we know, is rarely this straight forward. From the moment our bait hits the water it often seems that success hinges on our approach (for example our choice of tackle and/or bait), the weather or the feeding activities of the fish. Obviously, the choice of tackle or bait is within our control and can be amended throughout the day should things not go as initially planned. The weather can, and will, impact our day and the feeding activities of fish are often no more predictable than a change in wind direction or aggressive sun shower. However, today is perfect, your planning was meticulous and your choice of bait and method has lured many fish, but for the first hour your float sits statuesque. It is in my experience (and let it be known that I am purely a leisure angler and far from expert) that the first hour can be pivotal for your experience and much of this is down to our psychological reactions to a lack of immediate success, rather than the aforementioned factors. Angling can be a harsh pastime, reminiscent of pontoon in that it can often leave you deciding whether or not to twist, stick or twist again - and then spend the next few hours wondering if you made the best decision. Shifting through renowned fishing magazines, it is noticeable that we are swamped with tortuous amounts of information regarding rigs, trends in bait and the latest gadgets that light up, flash and vibrate whenever a fish is within half a mile radius of our hook. However, seldom mentioned is the psychological state of the angler and how this can be impacted throughout a session and how the psychological state of the angler can, in turn, impact upon a session. I have heard many anglers, in particular leisure anglers, suggest that their relationship with the sport is built upon the premise that they can ‘switch off and relax’ – yet I find myself ending many sessions mentally fatigued with the die-cast guarantee of a good night’s sleep. With this in mind, and for those who remain sceptical at the importance of being ‘mentally right’, I will attempt to put forward an argument that might just encourage you to reconsider. Bradley Busch, a leading Sport Psychologist who has worked with a variety of elite sport clubs suggests that “Maintaining confidence, dealing with anxiety or anger and keeping your focus are just as important in the sporting arena as they are in the boardroom or the classroom” and I would argue that this also applies to the lake side or river bank. Confidence is a strange thing in fishing, as its levels are not often determined by your own technical ability but rather by your intuition and the cunningness of your opponent. Yet this is not like playing a tennis match against Rafa Nadal, as your opponent is submerged and rarely makes an appearance – particularly if they are feeling exceptionally competitive. It is difficult to know their next move and in these situations intuition should not be dismissed. We can all say that regardless of an initial enthusiasm towards the appearance of a swim, there are times when it just ‘doesn’t feel right’ after an undisturbed opening period. Although this intuition is often triggered by a lack of obvious visual cues such as movements to the float or the tail patterns of feeding fish, if we do not react positively in terms of decision making, our confidence, after peaking upon arrival, can diminish quickly and impact upon our performance. The Inverted U theory links optimal performance to an optimum level of confidence and should our confidence be too high or too low, our motivation, and therefore performance levels, will dip. In terms of angling performance, by allowing yourself to remain in the same swim, or continue to use the same approach despite limited success for too long, it is almost certain that your confidence levels will decrease and this will impact negatively upon your motivation and ultimately your performance. 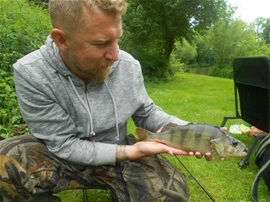 At this stage, it is important to address what is meant by performance in angling, as be sure that the outcome of your day is not wholly reliant upon the weather, tackle, bait or behaviours of your quarry. In this instance, performance should be considered as your physical reactions to the external variables that are out of your control. Performance in angling can be: maintaining high levels of awareness in consideration of the environment and spotting visual signs which could indicate a feeding fish; maintaining high levels of alertness and therefore reaction times in the strike (as I am sure fish know when we relax, take a drink, check a phone etc.) and adapting style of play by moving swim or changing bait/method if needed. Sir Alex Ferguson, former Manchester United manager was renowned for his enthusiasm in football with an unrivalled approach that demanded success. This was largely in part to his awareness of the external environment (e.g. his opponents), his alertness and reaction times in addressing things that were not proving successful and his ability to adapt his approach with a confident mind-set. As anglers, although we should not become consumed by the impact of our psychological state as I’m sure Sir Alex Ferguson did not, it is also important that we acknowledge the impact a lack of confidence and/or motivation can have on our day. I, as I’m sure we all have, have missed bites due to ‘switching off’ and reacting significantly slower to the unexpected disappearance of a float which was half way back to the surface by the time my fingers had clamped the reel handle and whilst I also identify that it is far easier said than done to maintain the levels necessary for the ‘perfect’ performance throughout the course of a day, it is important that we treat each cast like the one that will produce a red letter day. It just might be.